Although it is possible to divide the time of the Bowie into several, it is possible to argue that it is roughly “initial” from “Space Oddity” to the Ziggy era, following the first period. This work will be the title which recorded the initial studio out take and another version. Speaking of the album, the four albums “Space Oddity”, “The Man Who Sold The World”, “Hunky Dory” and “Ziggy Stardust” overlap at the time of release. Both are different from what you can listen now, which is very interesting content. 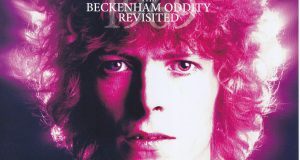 It is a single version released on June 20, 1969 of the same song recorded on the album “Space Oddity”. Beginning with the cutting of Akogi, the Bowie’s vocals are in front of the mix. 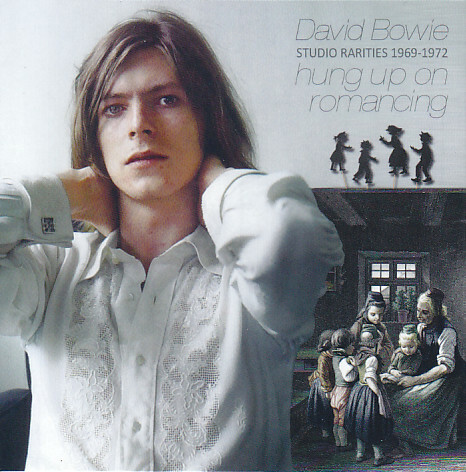 Although string instruments are contained, the main is a talking style of Bowie’s acoustic to the last. I would like you to compare it with an exotic original version. It is a demonstration sound source for TV show “Looking Glass Murders” that appeared in early 1970. It is not unusual for the performers themselves to appear, but for demonstrations as demonstrations. Two songs are recorded by playing by Bowie’s acoustic style. Both are quiet songs that were influenced by Dylan. Changing voice tone and using Hamming, Bowie himself is a sound source as if he is still searching for his own style. Only the last “Threepenny Pierrot” is a playful song by a light piano. The melody is obviously “London Bye Ta-Ta” of the later year, the lyrics are also significantly different, and the song composition is incomplete, but there is no doubt that it is the original song of this song. It is a 45 single version released in January 1970. “Prettiest Star” is singing with a restrained gentle singing turn. Again, a bowie vocal is put on the front and a mix with a discreet back is being made. “Conversation Piece” is an idyllic song with a very beautiful melody recorded on the B side of “Prettiest Star”. THE HYPE is a band formed by Bowie in 1970. These two tracks are the session sound source with that HYPE performed in January 1970. The encounter with this HYPE guitarist Mick Ronson and Tony Visconti will be the historical sound source in the sense that it will decide the sound of the subsequent Bowie. “Lightning Frightning” is daringly monotonous singing without intonation, and not only guitar and piano but also impressive saxophone has been added to the back, and in the early songs it is irritating. And the “Threepenny Pierrot” earlier developed, resulting in “London Bye Ta Ta”. It is finished with a glittering guitar, a piano that pauses, a stratified chorus work, and a typical example of gram rock. It is surprising that the simple music of that piano will be sublimated like this. It contains both sides of the 45 single released in June 1970. It is a spectacular song that adorns the end of “Space Oddity”, but Bowie himself probably wandered around how to complete it. Just like the “Beatles’ Strawberry Fields”, neither version can be thrown away, and maybe we decided to release various versions like this. Part 1 is closer to the album version than the intro, but as soon as the guitar comes to the front, the bowie sings lighter in line with the drum that marks the tempo. In the breaking part of the song, the keyboard gently broke in, and it got excited early in the first half of the song. Part 2 starts with the part of Ending · Coda’s Sun Machine is Coming down · · · and has developed only this part. From this fact, it turns out that this song was completed by connecting two songs. Although the title is different, it is clearly the original song of “Lady Stardust”. This is the earliest version recorded in May 1970. Although it is a simple performance of only piano, vocals are superimposed, which shows that it is quite a full-scale recording. As the initial version, the song composition and the lyrics itself are almost completed at this point. It is an outtake of the same song recorded in the album “The Man Who Sold The World”. It is a sound source from the acetate recorded in June 1970. There is no slime like the original and you get a clean impression. Being a single vocal also complements that impression. “Holy Holy” is a 45 single version acoustic sound source recorded in June 1970. And “I Tired Of My Life” is a demo sound source recorded in May 1970. This melody is “It’s No Game” without any doubt. “Scary Monsters” was released in 1980, so it is actually 10 songs ago that songs that were already the basic songs were already made. The momentum of the up tempo as in the release version is hidden, and it has become a spacious arrangement. “Right On Mother” is a small piece recorded by the piano playing recorded in the first half of 1971. It is a masterpiece that you can enjoy “Yo no Boui”, which is very bowie-like, with cracking, falsetto and humming inserted in the middle. “Andy Wahol” is an acetate sound source of outtakes recorded in March 1971. Unfortunately it is only intro, but in the release version it is valuable that has been recorded long enough to be unable to hear. “Rupert The Riley” was recorded on April 23, 1971. It is a nice song, but the effect sound of the motor etc. was also dubbed and built in to a certain extent, but it still can not deny the unfinished feeling. The relationship with Rupert of anime bear is unknown. “How Lucky You Are” was recorded in May 1971, this time “Yoga no Bowie” is a song that can be enjoyed. It is a song unique to Bowie with a typical song composition that repeats the bowie quietly singing out in accordance with the rhythm that the piano carves, then gradually rising up, returning to the quiet piano at the apex again. “Man In The Middle” was recorded on June 17, 1971. The main vocals are played by band members other than Bowie. “Bombers” is an outtake of “Hunky Dory” taken in June 1971. It is almost like the completed form, and there is no big difference from the released version. It is another version of recording in June 1971. The vocal is another version, and the arrangement is somewhat sharp. 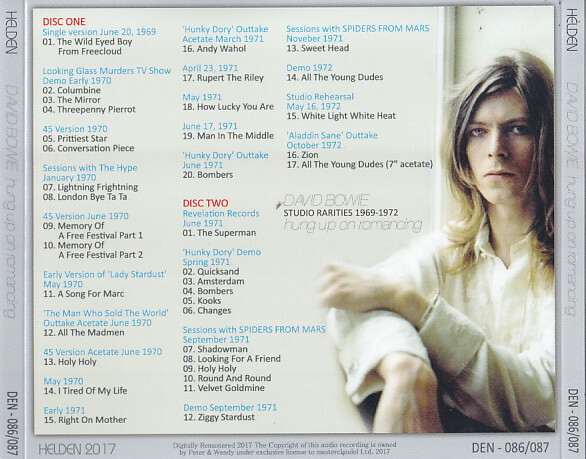 The above five songs are demo sound sources of “Hunky Dory” which was recorded in the spring of 1971. 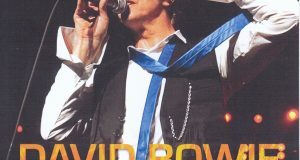 Bowie’s vocal, whose bell sounds at the ear, keeps musical instruments to a minimum, is the main demonstration sound source. Occasionally the vocals become double tracks, and it seems to be probably a demo to instruct the band members. Especially the demonstration sound source of “Changes” which is one of Bowie’s representative songs will be valuable. After this, it is the first version of the theme song of Bowie who repeatedly sings for the whole life, only by piano. It is interesting to have sound effects on the breath sound and ha ha ~ in the intro. Bowie who has released albums with different ambient atmosphere, acoustic guitar “Space Oddity”, guitar sound main “The Man Who Sold The World”, piano the main “Hunky Dory”, each recognized as a big name Well, maybe not from “Ziggy Stardust”. The five tracks were recorded in September 1971 with a session with SPIDERS FROM MARS who creates “Ziggy Stardust” together. It is becoming a sound conscious of the band sound with the guitar as the center more than the former album. Only the final “Ziggy Stardust” is a demo sound source by Bowie’s single acoustic guitar. “Sweet Head” is a session with SPIDERS FROM MARS, but this sound source only is recording in November 1971. Japanese title “All young guys” is a demonstration sound source in 1972. 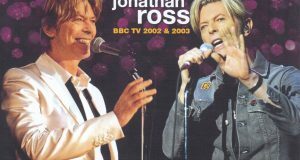 It was originally a song that Bowie offered to Mott the Hoople, but after that Bowie also became one of the representative songs, such as playing on the stage. And this song is not only a representative song of Bowie, it is a famous piece of masterpiece that is a standard of rock as an anthem for Gram / Rock. While this truck is a demonstration sound source, the beauty of that melancholy can not be hidden, and it has an atmosphere of masterpieces already in history from this stage simple. It is a studio rehearsal sound source performed on March 16, 1972. It is supposed to be a rehearsal for that, as we are declining concerts in Birmingham the following day. Just as rehearsals in the course of the tour, the performance is fulfilling itself, as thick guitar sounds explode, it is a performance as the actual stage.